May 15, 2015 – A team of engineers is testing hydrogen burn-off igniters for NASA’s Space Launch System at NASA’s Marshall Space Flight Center in Huntsville, Alabama, where the program is managed for the agency. SLS will be the most powerful launch vehicle ever built. It is designed to be sustainable and evolve to carry crew and cargo on deep space missions, including an asteroid placed in lunar orbit, and ultimately to Mars. NASA uses highly combustible propellants: liquid hydrogen and liquid oxygen to power the RS-25 engines. These engines, along with solid rocket boosters, lift the rocket into orbit. If too much excess hydrogen is allowed to accumulate beneath the vehicle and ignites, then the resulting blast wave could potentially damage the vehicle and the surrounding structure. Igniters are used to prevent large-scale accumulation of excess hydrogen from forming during launch. Engineers are testing the igniters to ensure that they function as intended, considering the SLS launch aspects of pad configuration, water suppression system and wind effects. The combination of these SLS launch aspects are different than the shuttle, necessitating the current test series. Four RS-25 engines will be part of the rocket’s propulsion system, and the vehicle will have 12 hydrogen burn-off igniters per launch attempt. The igniters are not part of the propulsion system and don’t pose a risk to the engines themselves. Nine tests are planned for the test series, which began May 5 at the Army’s Redstone Test Center on Redstone Arsenal in Huntsville. The test center was used due to its certification in handling pyrotechnics, test stand availability and operation expertise for this kind of work. 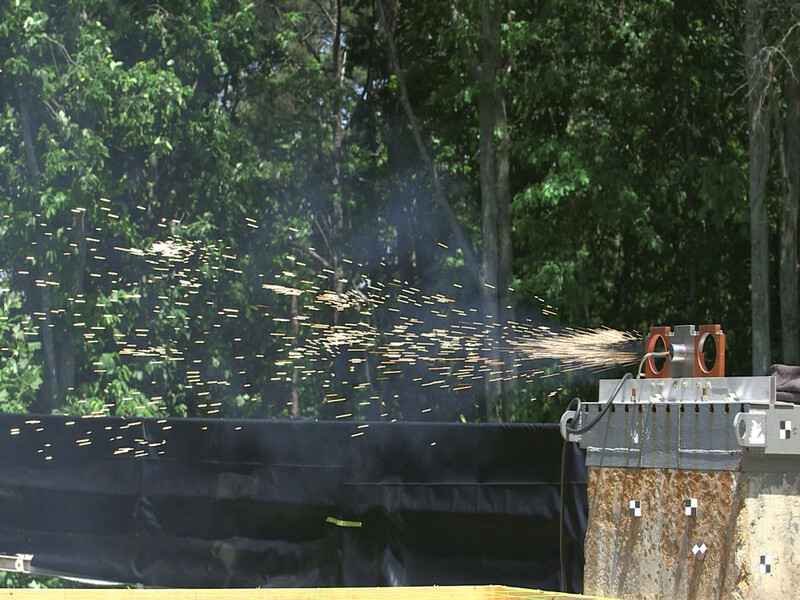 During testing, the igniters are fired, and high-speed cameras record several measurements, including the throw distance and area coverage of the particles. Fans create various cross-wind environments similar to the conditions the vehicle may experience at launch. Weather permitting, testing will wrap up in mid-May. The first flight test of SLS will feature a configuration for a 70-metric-ton (77-ton) lift capacity and carry an uncrewed Lockheed Martin-built Orion spacecraft beyond low-Earth orbit to test the performance of the integrated system. As the SLS evolves, it will provide an unprecedented lift capability of 130 metric tons (143 tons) to enable missions even farther into our solar system.